To continue this series with a surely reasonable premise alluded to in what I wrote on the stripy baselayer last time out, if a shirt – the long-sleeved shirt – has a pattern on the lower part of the sleeves, watermarked or otherwise, then a baselayer to be worn with the short-sleeved shirt should include the pattern on the lower part of the sleeves. This is basic stuff, right? It will always pain me that the proto-baselayer (probably a sweatshirt) worn by Argentina against Linfield in 1990 was plain, rather than fully isometric’d-up and adidas-striped. Admittedly, being nearly two decades before the performance technology item really became popular – though this example from the late 1990s is quite the anachronism – meeting my requirements really would have been something. But why is it so rare in 2018? I can only think of one example, prior to this season, of a baselayer that matches in this way, and it’s an obscure one. Gaelic football player Denis Corroon of Westmeath wore a maroon jersey and baselayer with a lovely chequered pattern – props to O’Neills – and it even had the three stripes of adidas O’Neills running down the sleeves, albeit with inexplicably different spacing. So a bit of the stripy baselayer thrown in for good measure. Corroon continued to wear this baselayer as Westmeath changed their outer shirt to a stripes-on-panel affair – think Chelsea winning the Champions League in 2012 – but this is a minor aberration. For another example – Puma, once again, come on down. In 2018-19, the black cat company have given us textured baselayers as well as stripy ones. Olympique de Marseille, were the first I spotted, and I did at one stage think Borussia Dortmund had their own with their domestic home shirt, but what I had noticed was a Dortmund staple of the long-sleeved shirt having a distinctly short-sleeve-over-long-sleeve build – confusingly not replicated on the replica shirts. When BVB players have worn baselayers, they’ve been yellow, sadly, but Arsenal players wearing ‘matching’ textured-stripe baselayers with their Away shirts, seems to me the perfect way for Puma to say goodbye (assuming it’s not a Dortmund-y trick). The advent of patterned baselayers does render recent missed opportunities even more heartbreaking. Juventus had zebra stripes – which we’ll call a pattern rather than stripes in the earlier sense – on their third shirt’s sleeves in 2016-17, and these ran down to the bottom on the rarely-seen long-sleeved version, yet the Old Lady wore plain white baselayers with the short-sleeved versions. Canterbury, to their credit, did provide tiger-striped baselayers for Leicester Tigers, and that was years ago! Below, you’ll see the correct approach. What about the much-lauded Nigeria shirt worn for one game in the World Cup? Is it so hard? And Nike have let themselves down further. Their pseudo-stripe – taking a soundwave-esque form – seen on so many kits is yet to appear on a baselayer. This may be due to the Vapor technology approach, perhaps admirably, pulling the rug from under the baselayer received wisdom (if you think about it, if you wick sweat out onto the inside of another layer, what good does it do? ), but the blurb’s eschewing has not been reflected in the players’ freewill. As much as I loved Kylian Mbappé’s use of a lighter baselayer to augment his soundwave during the World Cup, the look is compromised and should be amended. Likewise, Tottenham Hotspur’s alteration with their away shirts (navy baselayers at Tranemere in the FA Cup, a lighter shade against Fulham in the league) is an acknowledgement that there must be a better way. Interestingly, adidas produced baselayers for Spain which had their 2016 away shirt’s ‘heatmap’ pattern on the lower part of the sleeve. Alas, the long-sleeved version of the away shirt didn’t have the embellishment and, as far as I’m aware, the baselayers were never called into action. Similarly, the French national rugby team recently wore ‘circuitry’-styled baselayers which neatly matched the pattern on the torso of the outer layer. Now, the short sleeves of the outer layer were plain, so the circuitry lower down the arm was perhaps unnecessary, but as I’ve found no evidence of a long-sleeved shirt ever being worn or even existing, we’ll put this down as a thoughtful touch. Unfortunately, there are no rules in rugby regarding uniformity of baselayers, so some players wore black or white. The FFR have form in this regard, with Serge Blanco sporting a pair of cycling shorts which carried the classic tricolore adidas stripes. 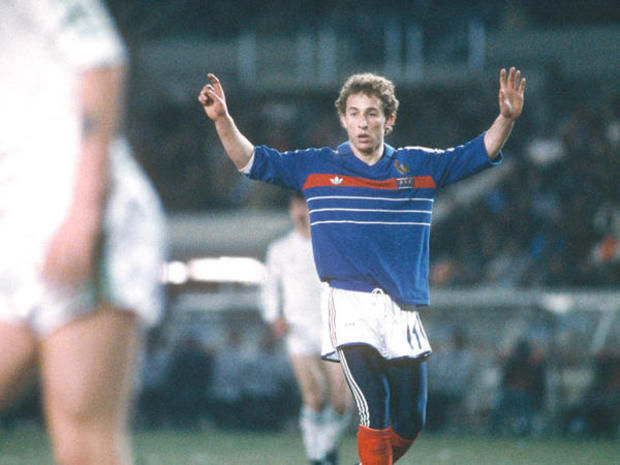 Jean-Pierre Papin got close, but no cigar. Anyway, I digress. Good on Puma. Again. This seems very promising, and Part 3 will reveal more. Why can’t footballers simply wear a long-sleeved jersey over a long-sleeved undershirt? One of the great mysteries of our time! There’s debate over the point of baselayers anyway, so it may be that long-under-short is simply a fashion of questionable aesthetic preference. To play devil’s advocate – representing those devlish players – perhaps the mobility/motility provided by a long-sleeved baselayer would be compromised by having a perhaps less stretchy full-length layer over the top.